Visicorp Visi On is first GUI for IBM PC and MS-DOS/PC-DOS Computers. 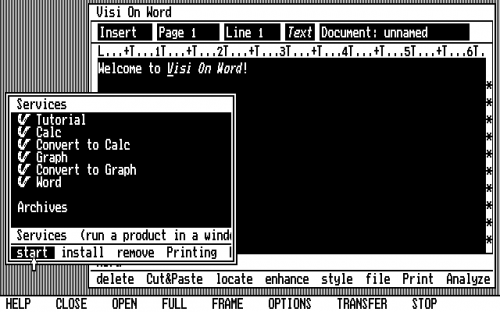 After success Visicorp VisiCalc they came up with Visi On. 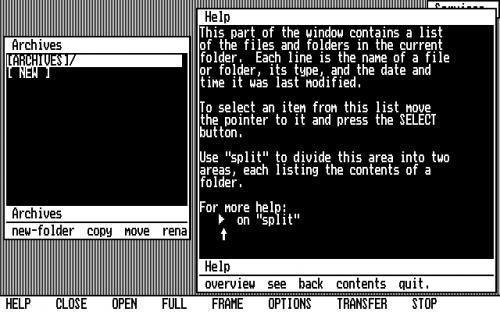 Visi On was short lived GUI Program for IBM PC. In early 1982 Personal Software changed their name to VisiCorp because VisiCalc was Success they want milk VisiCalc name with product Visi this Visi that. Visi On did not have Icons. Visi On have first GUI Help program. The "Applications Manager" is the Visi On graphical operating environment. It must be installed before installing any other Visi On application software, such as Visi On Graph, Visi On Word, or Visi On Calc. Visi On was demonstrated at the fall COMDEX show in 1982 there was Bill Gates saw Demo have worry he did not GUI product that the time and Microsoft Windows was on starting board. After Demo Bill Gates started working on Microsoft Windows. Visi On have extremely high system requirements by 1982 and 1983 standards. It needed 512 kilobytes of RAM and a hard disk at a time when PCs shipped with 64k-128k and IBM did not yet offer a hard disk with the PC (IBM's first model with a hard drive, the PC XT, didn't ship until March 1983). Third-party drives were however available at the time, typically 5MB units that connected to the floppy controller and were treated by the operating system as an oversized floppy disk (there was no subdirectory support). However this huge success led to a number of very serious problems with Visi On. Delay of Visi On what led most problems and December 1983 release date did not help too. That aloud Bill Gate came up with Microsoft Windows in 1983. In fight with Corporate Executives at VisiCorp and Software Arts did not help too, it made problem worsted for VisiCorp. Visi On High system Requirements what started Visi On Low Sales did not help Visi On in Software Market. VisiCorp sue Software Arts for delay of VisiCalc that help Software Arts. That cause VisiCorp get Sold to Paladin Software. The new company kept the Paladin name. 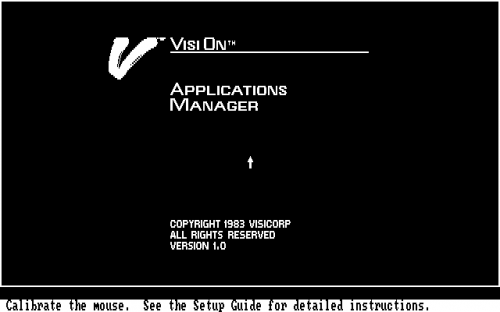 VisiCorp, and its line of "VisiProducts", were history. Visi On was seen First flop Software History and gave the boost Bill Gate push Microsoft Windows to Finish Line. 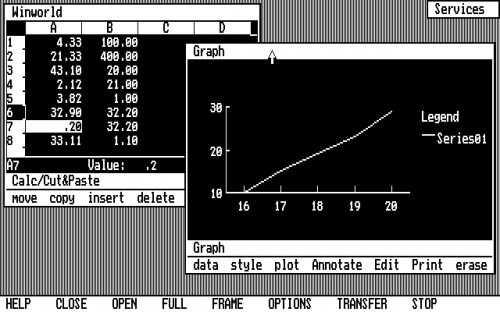 Visi On is revolutionary because it was first GUI for IBM PC and MS-DOS/PC-DOS. Last edited by johnlemon647 on Sun Aug 12, 2018 7:41 am, edited 2 times in total. Visi On was demonstrated at the fall COMDEX show in 1982 there was Bill Gates saw Demo have worry he did not GUI product that the time and Microsoft Windows was on starting board. After Demo Bill Gates started working on Microsoft Windows. That's a rumor I've yet to see any evidence for. VisiCorp made a lot mistakes with Visi On. Bill Gates did benefits a lot mistake was made by Visi On. Visi On is like Apple Lisa it was too far head for time which a loud other competitor by to catch up them like Microsoft Windows, IBM TopView, GEM and Apple Macintosh. Some people said they saw Bill Gates at Comdex 1982 here VisiCorp Visi On was Shown there. VisiCorp Visi On did beat Bill Gates on have first GUI for IBM PC. While Microsoft Windows spent Two Years on Vaporware Mode in still November 1985 release of Windows 1.0.